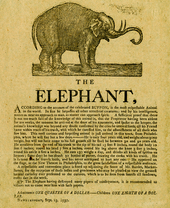 “The Elephant,” 1797. Broadside with woodcut illustration, printed by William Barrett, Newburyport, Massachusetts. Collection of The New-York Historical Society. As we—like Lady Justice at her scales—weigh the virtues and policies of our presidential candidates, our very future in the balance, it is perhaps not without merit to reflect upon the classical history of democracy, and a fledging nation, now great, which has taken up a banner of representative government as passed down from the Greeks and Romans of antiquity. Perhaps, as well, as the airwaves are electric with the storied truths apropos to this most momentous of elections—this cotterpin in the history of humanity, perhaps the very universe, this year of destiny, of DECISION 2012!—we might look to the birth of our comedic and dramatic tradition, which we will find in the Dionysian festivals of Ancient Greece. Or, wait, is it more of a circus? Circus it is. Hollywood may claim Aristotle as a father, and Washington may fancy itself an ancestor of the Roman Republic, but don't we all know that our truer father is P. T. Barnum—tabloid king and political boss—and that our truer tradition is the circus, three rings?